I first heard of Ch. 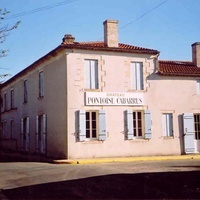 Pontoise Cabarrus in the Spring of 1996 when John Rydman (Spec’s president) and I were looking at lists of wines for sale as futures. He bought (I didn’t come to work for Spec’s for another few months) a pallet (56 cases) because it was an Haut Medoc that was priced right. Neither one of us knew anything about the property so we might as well have been throwing darts. In the spring of 1997, I was in Bordeaux (working for Spec’s by then) and got to taste not only the 1995 but also the 1994 and 1993 wines from Ch. Pontoise Cabarrus as well as the barrel sample of 1996. I actually got to taste all of them three different times at three different negociants’ offices. I realized at that point that we had gotten lucky. The wines were really good and we (Spec’s) have followed them since then. It wasn’t until 2009 that I actually got to visit the property to meet and taste with winemaker/owener Eric Terygeol but I have been back several times since. Owned by since 1959 by the Terygeol family and now run by Eric Terygeol with consultation from the famous Boissenot family, Ch. 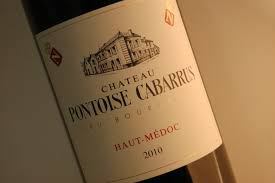 Pontoise Cabarrus traces its roots back to the Baron de Brane (then also owner of Brane Mouton, now known as Ch. Mouton Rothschild) in the 1700s. Located just adjacent to the St. Estephe appellation in St. Seurin de Cadourne in the Haut Medoc appellation, Pontoise is immediately adjacent to and shares the same terroir and exposures as Ch. Sociando Mallet. The vineyard is planted to a blend of 55% Cabernet Sauvignon, 35% Merlot, 5% Cabernet Franc, and 5% Petit Verdot, mostly on well-drained gravelly slopes close to and facing the Gironde estuary. The Cabernet Sauvignon and Petite Verdot are on deep gravel and the Merlot is on clay over limestone. The Caberent Franc is where they meet. The location and situation are ideal for producing elegant Cabernet Sauvignon-based red wines in the classic style. Alcoholic fermentation is in temperature controlled concrete tanks with pump overs. Malolactic fermentation and aging are in French oak barrels. The percentage of new barrels has increased from 25% to now 33% while time in the barrels has decreased a bit. Rather than new world, these are classic claret-style reds with elegance and finesse to go with their generally more red than black fruit and distinctive notes of tobacco leaf, cedar, and gravel-dust terroir. This personal favorite of mine is an every-day priced Bordeaux you can drink now (decant it roughly if you do) but that will reward your keeping it for up to 10 years. I can’t think of a more consistent or better value in a Cabernet-dominant, classically-built Bordeaux red.